I was looking for a frozen yogurt place (and Atlanta is full of them) but they all seemed to have closed already, as it was a weeknight. 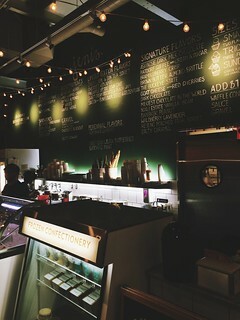 So when I saw Jeni’s Ice Cream in the Westside Atlanta area, the first thing I noticed was that it was open, and even crowded. And the second thing I recalled was that I had eaten Jeni’s Ice Cream once before, from a food truck on a South by Southwest parking lot in Austin. But the permanent stores have far more flavor choices (such as the peanut-buttery Buckeye State which I ordered) than the trucks, and the all-natural ingredients make for great flavor and texture. I also have to notice and appreciate the later hours than most other Atlanta frozen dessert shops, which means that when most places are closed, Jeni’s is likely still open. The Ohio-based company makes its ice creams with only natural ingredients and flavors, and is definitely worth a visit. 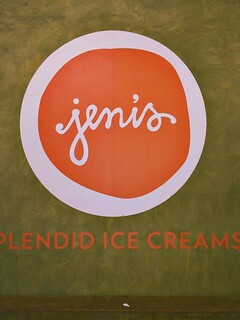 In addition to the Atlanta store, Jeni’s can be found across Ohio and in Nashville, Tennessee. When all else fails, it can also be ordered online and shipped to you where you live.